Landale Signs(TM) completed the design, manufacturing and installation of a second state-of-the-art video billboard sign for Northern Alberta Institute of Technology (NAIT). The first sign was installed at the Main Campus in 2008 and the second sign was installed in October of 2009 at the Souch Campus. Landale Signs(TM) continues to transform traditional on-premise signage marketing by fusing modern design with industry leading video technology to achieve an unparallel communication and branding experience. This unique marketing solution is a perfect fit with NAIT’s mandate to use innovative technologies to create a sustainable marketing advantage as part of its corporate strategy is to maintain its leadership position in new technology initiatives. “Our partnership with NAIT has simply made us a better company. NAIT had a need for much more than a traditional pylon sign. NAIT needed reinvention. They gave us (Landale Signs(TM)) an opportunity to fuse signs, art and technology to produce a unique signage solution that was perfectly matched to its ambition to continue to lead technical advancement throughout Alberta and Canada” stated Michael Yurechuk, Executive Vice President of Landale Signs(TM). The sign’s presence is simply iconic. It is strategically located to make it the focal point of the campus traffic. The sheer size of the sign is impressive at a height of twenty-five feet and weighing close to 7000 lbs. The design is bold yet simplistic as the casing boasts complex curves with interesting angles making the sign architecturally impressive. The sign itself can be considered an artistic monument as much as it is used as an advertising medium. The cutting edge video display technology offers exceptional brightness, streaming video, picture clarity and billions of dazzling colors allowing for content creation that is limited only by the imagination. The video billboard sign will be a central component for all of NAIT’s marketing and corporate social responsibility programs as it can target messages to any stakeholder including new and existing students, faculty, alumni, partners and the community at large. 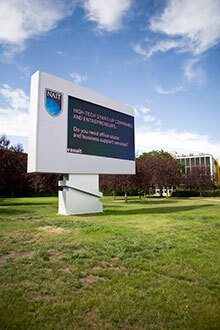 As a result of the Landale Signs(TM) video billboard, NAIT will continue to enhance its world class technical reputation.